General Motors on Thursday confirmed that the 2017 Cadillac CT6 will be able to drive itself in certain conditions using the company’s “Super Cruise” system. On top of that, a fleet of self-driving 2017 Chevrolet Volts will chauffeur GM employees about the Warren Technical Center campus in a “rapid-development laboratory” testing program starting late 2016. 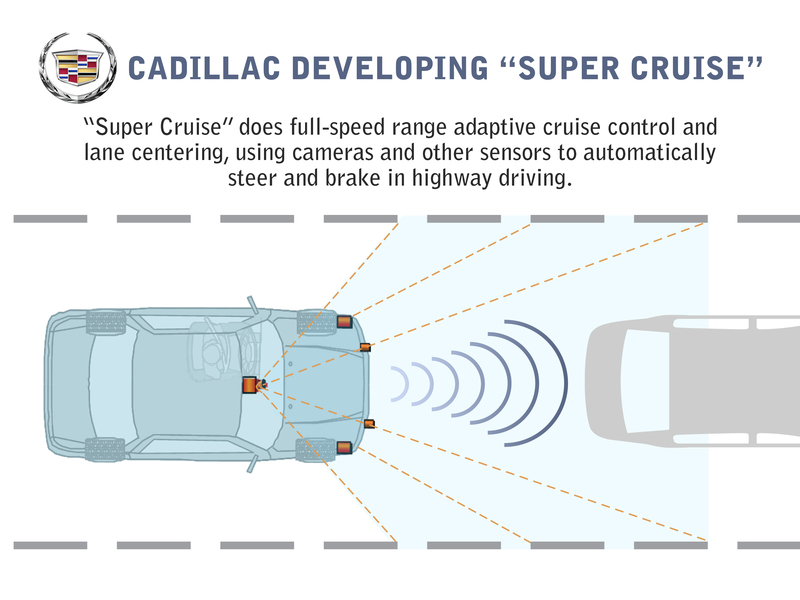 The Super Cruise technology, which the automaker had already all but said was coming to the CT6, lets the car perform “semi-automated driving including hands-off lane following, braking and speed control under certain driving conditions,” according to a 2013 Super Cruise news release. “The system is designed to ease the driver’s workload on freeways only, in bumper-to-bumper traffic and on long road trips; however, the driver’s attention is still required,” GM wrote then. While an impressive achievement, these areas are considered the most-proven, “low-hanging fruit” of autonomous driving — nobody’s expecting true self-driving this decade. However, such partial self-driving also handles the scenarios in which driving can be the biggest chore and many would probably like to let the computer do the work. For collision repairers, the bumper-to-bumper self-driving could be particularly problematic as gridlock can result in a lot of rear-ending business. Plus, there’s no getting around the fact that 90 percent of collisions are caused by human error. Even if OEMs never crack full autonomy, a 20-50 percent reduction in that “stupid human” stat could cost repairers a lot of work. But for the CT6s which do get into crashes, the vehicle is notable for its mixed-materials but aluminum-heavy body as well as its dedicated repair network, GM also touted the steel-to-aluminum welding process used on the car on Thursday. Also coming to the 2017 Cadillac fleet will be standard “vehicle-to-vehicle” technology on the CTS, considered a useful way to ease the task of self-driving. GM’s system, often referred to as V2V and announced in July for the CTS, will let cars tell each other their positions, braking status and speed. As U.S. News & World Report observed in May, the CTS might not have anyone to talk to for now. However, the magazine also reported OEMs are working on standardizing communications and the NHTSA supports it, so the Cadillac might not be lonely for long. Speaking of potential disruption, international collision repairers should also take note of GM’s comment Thursday to release “a large number” next-generation or refreshed vehicles across the world within five years. Make sure you’re up to date on whatever repair procedures could be recommended for your country’s models.